Good run across 16 km tonight with some good undulating ground. Headed out just after a sprinkling of rain so the air was fresh and cool, and about 20 minutes before ending some welcome light, cold rain started falling. The course departed Hyde Park to Rose Bay via New South Head Road, then heading south to Bondi via Curlewis St and returning to Hyde Park via Bondi Road and rejoining New South Head Road through Ocean St. This is a good course- good views and with some good flat stretches mixed with some ups and downs that make for a challenging run. I felt fresh tonight, and ended strong feeling in good shape. 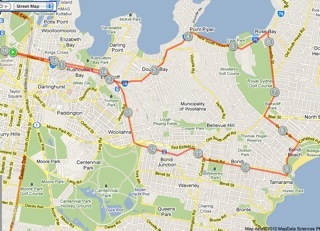 I didn’t time the run by across the three ‘legs’ (Rose Bay, Bondi and finish) but did keep track of total time taken. I as maintaining a reasonable and comfortable pace, but not smashing any land speed records either. I didn’t measure heart rate, but did note weight before and after the run. For anyone training for the City to Surf next year, this is a good course to keep in mind. On the homeward leg I bumped into Jamie Chivers and spoke briefly. Jamie has been active supporting causes addressing poverty in India himself over the last two years. This entry was posted in Bondi, Rose Bay, Training log and tagged Bondi, New South Head Road Sydney, Road running. Agency, brand and trust: help or hindrance? Did you read the news today!!! It’s all over! Poverty ends for ever!